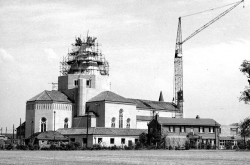 In 1949, development work began on the Woodhouse Park estate bringing new residents, many of them Catholics, from the older areas of Manchester. 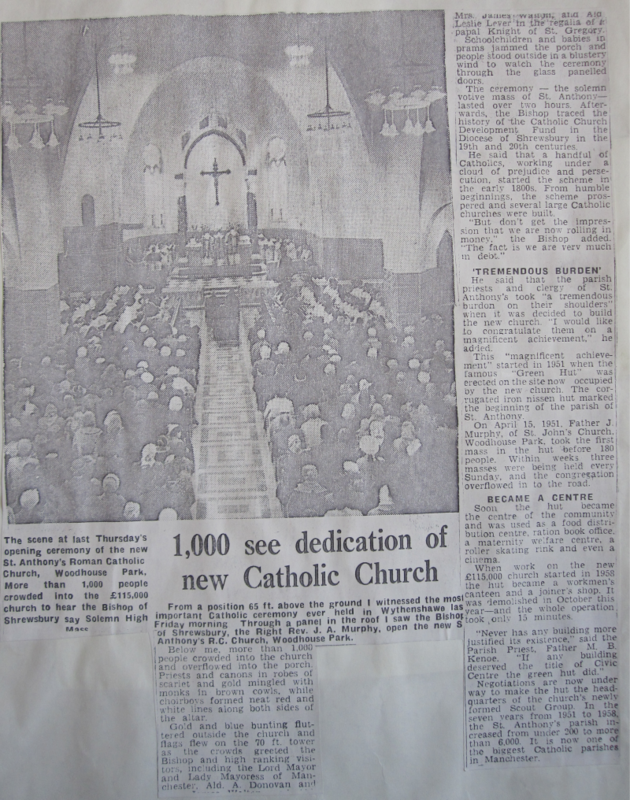 A new parish was planned and the Band found a new home. with a view of the Green Hut, bottom left. Thanks to Ian "Gonzo" Dewis for the photo.For the first two years, mass was said in the open air on the site where St. Anthony's church now stands. Then, in 1951, the famous "Green Hut" was erected. 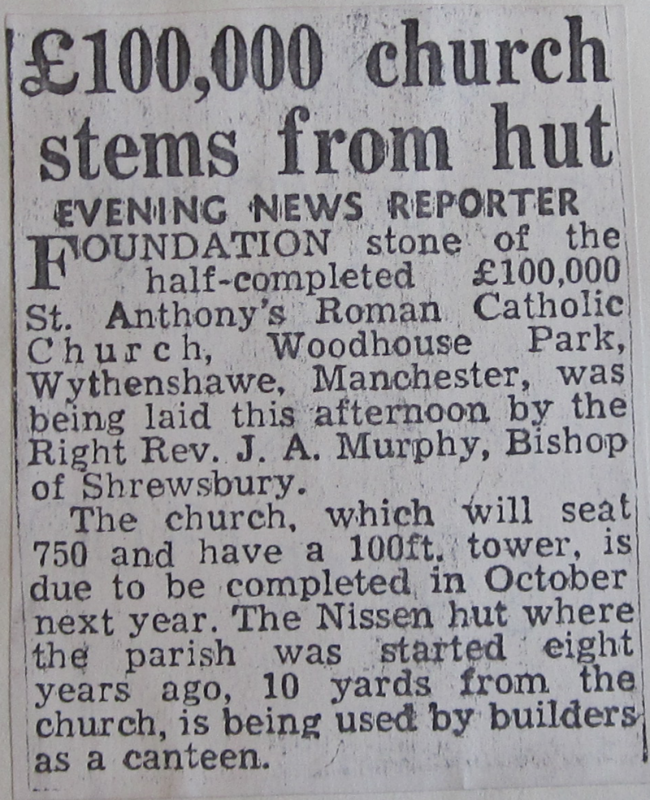 The green "Nissen" hut was the first public building in Woodhouse Park, on the site of the future church, near where the altar now stands. 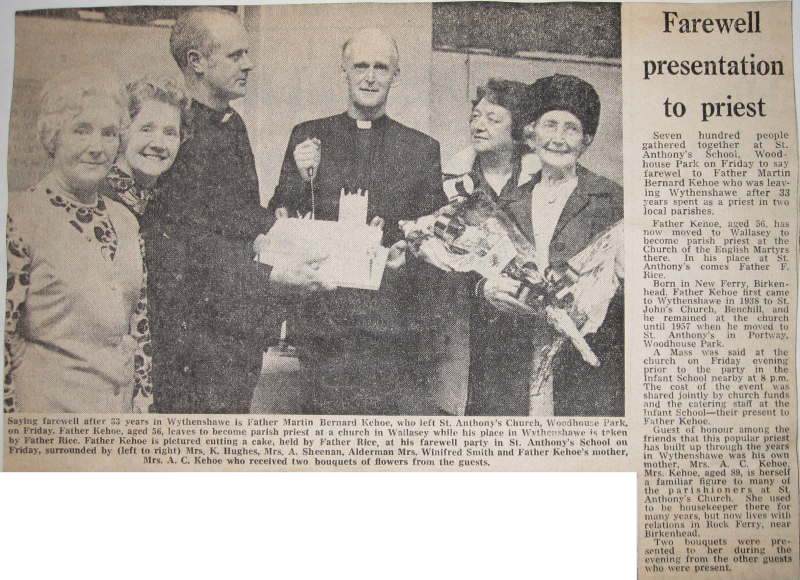 On 15th April 1951, Father Murphy, parish priest of St. John's, Benchill, said the first mass in the Green Hut. The hut rapidly became a "community centre" for the area's Catholic and non-Catholic families. It was used as a dancing school, a maternity welfare centre, a polling booth and even a roller skating rink. 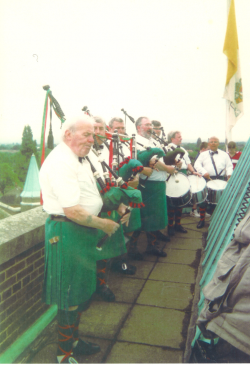 In subsequent years, it provided a home for the youth club, under the leadership of Terry Dowling, by then the Band's Pipe Major. 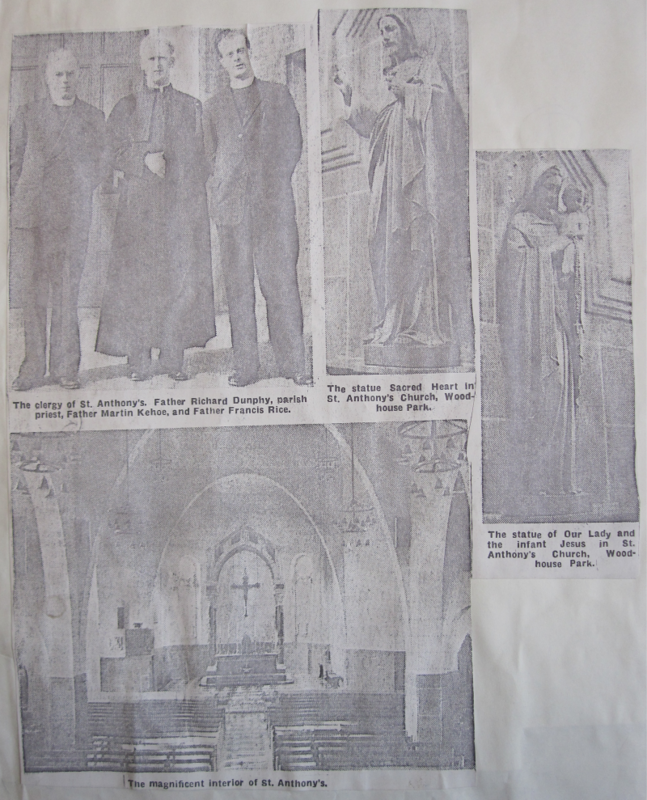 In 1953, Father Kehoe, who had played such an instrumental role in establishing the Pipe Band, was appointed Parish Priest of St. Anthony's and moved into the newly built presbytery. 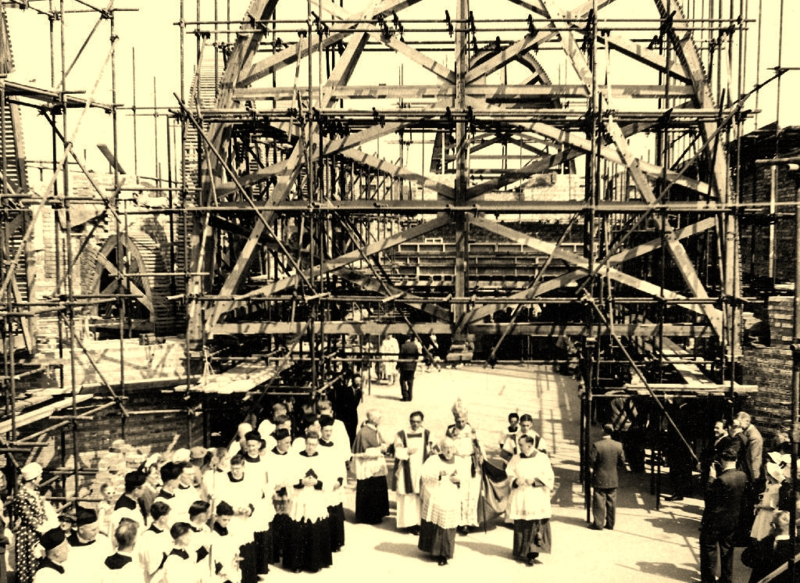 During the same period, construction work began on St. Anthony's Primary School. 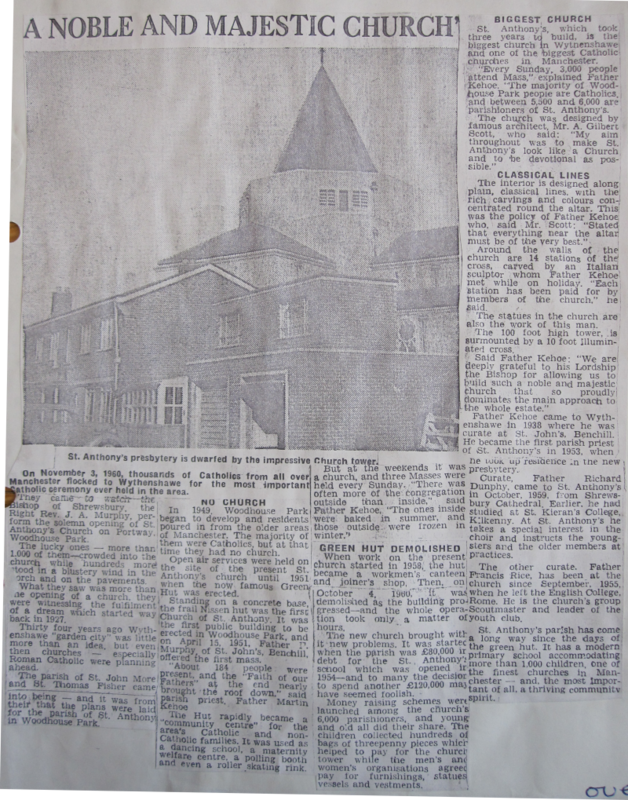 The school was completed in 1954 and mass was transferred from the Green Hut to the school hall, the first service being held on 30th August 1954. Mike Rafferty and Mike Barker on the front row. 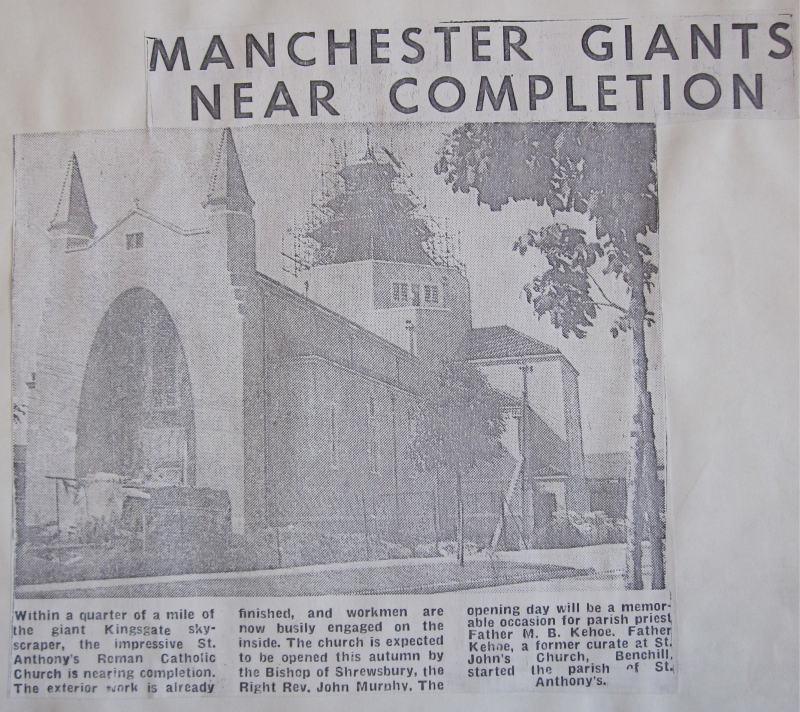 In the mid-fifties, as the new Parish began to take shape, with more and more parishioners arriving in St. Anthony's, Father Kehoe offered the Band a new home, in the more spacious environment of St. Anthony's Junior School hall, which is once again home to the Band more than half a century later. 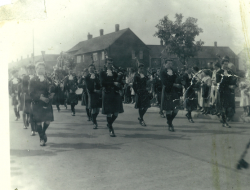 The Band soon became a familiar feature of life at St. Anthony's, performing at church processions, school fetes, and many more parish events. on the front row, behind John Faulkner on the mace. 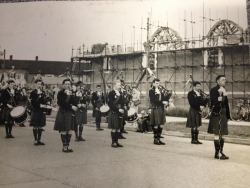 From the Fianna Phádraig Pipe Band photo collectionConstruction work on St. Anthony's Church began in 1958 and was completed in October 1960. The Band took part in numerous events held during the period. 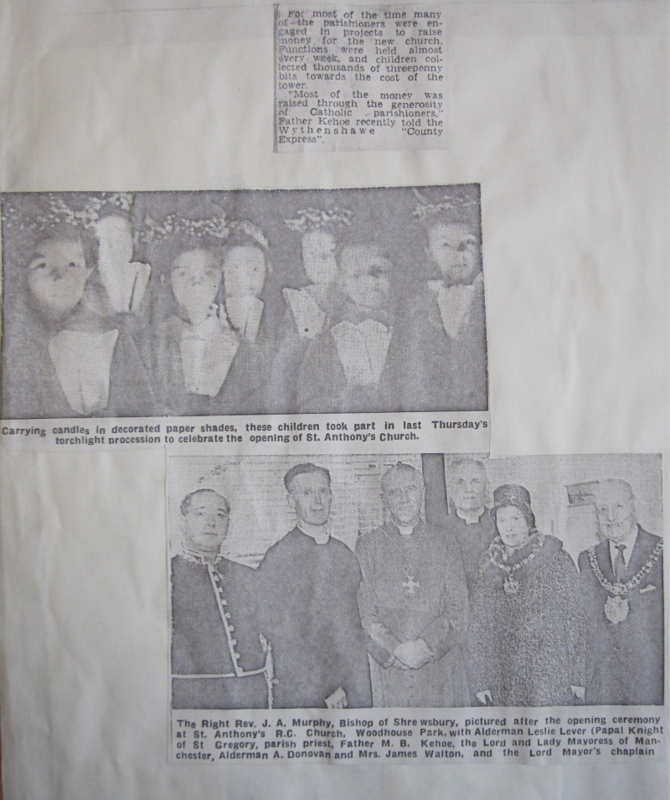 It's even thought that the Band's first bass drum, donated by St. Eugene's Temperance Band in Omagh, through the good offices of Father Kehoe, was placed in a 'time capsule' buried beneath the church alongside various other items representative of parish life throughout the fifties. 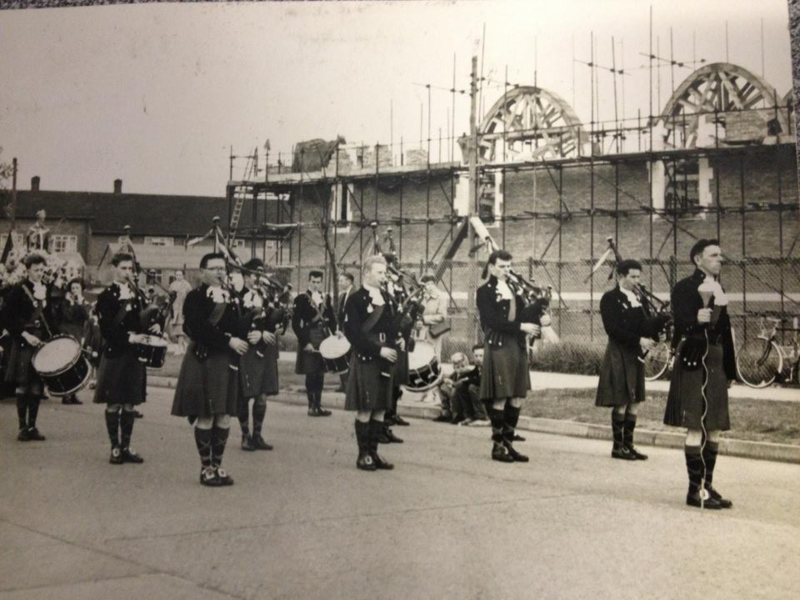 The picture opposite shows the Band playing on Portway, in front of a partially built St. Anthony's. John Hyland, Bill Lisgo, Peter Cummins & Jim O'Connor. 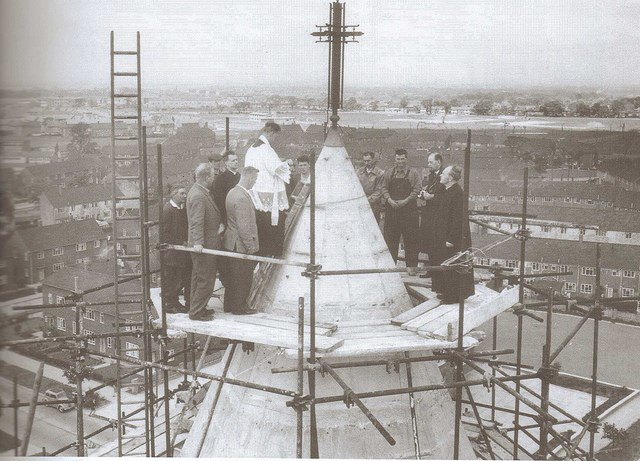 Once the Church was completed, Band members Mike Barker and Jimmy Hickey celebrated the event by playing on top of the cross tower, around the copper spire. 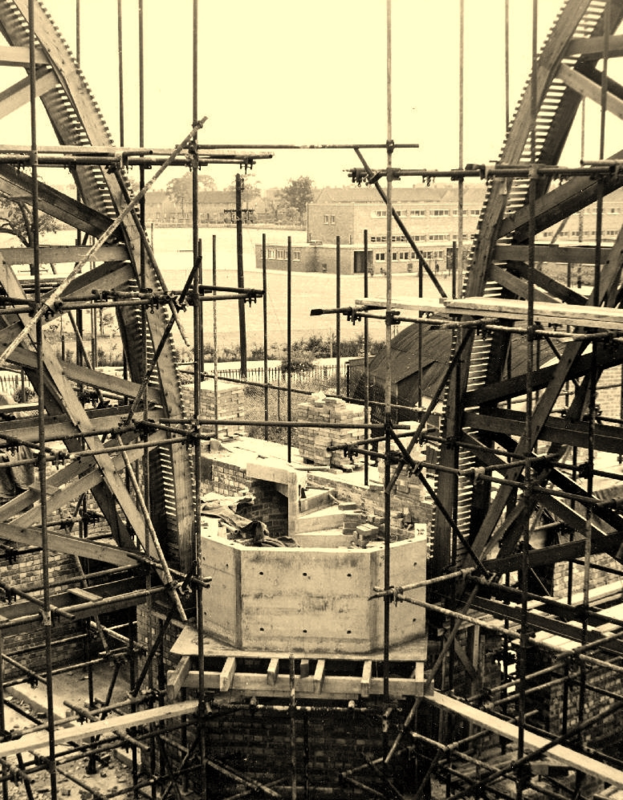 Some fifty years later, Band members climbed back up the tower to repeat the feat. In the photo opposite, we can see Ken Topp, Mike Coffey, Dominic Fitzmaurice, John Hyland, Bill Lisgo, Peter Cummins and, finally, Jim O'Connor, a contemporary of the pipers who first played up on the cross tower back in 1960. Unfortunately, we have not been able to trace a photo of the initial performance on the cross tower. If you know of one, please contact us via the contact form. To this day, the Band is still associated with St. Anthony's Parish and currently practices in the school hall every Sunday. 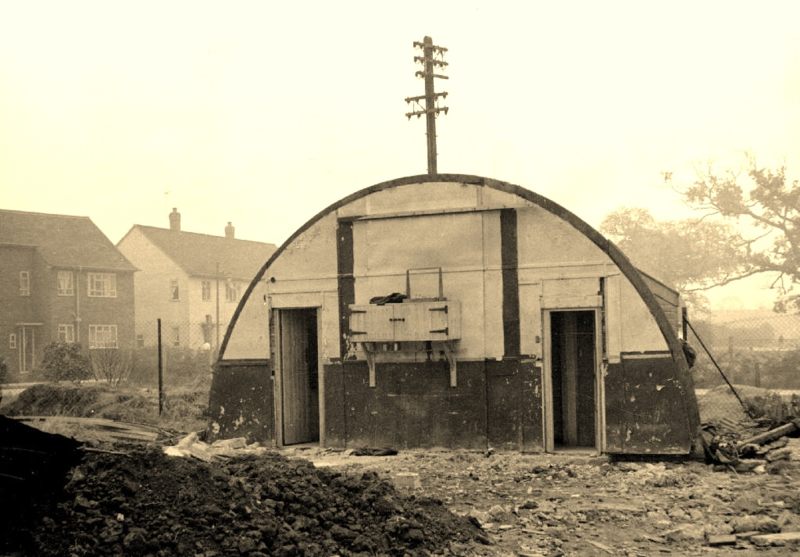 Part of the Green Hut, shortly before its final demolition in October 1960. 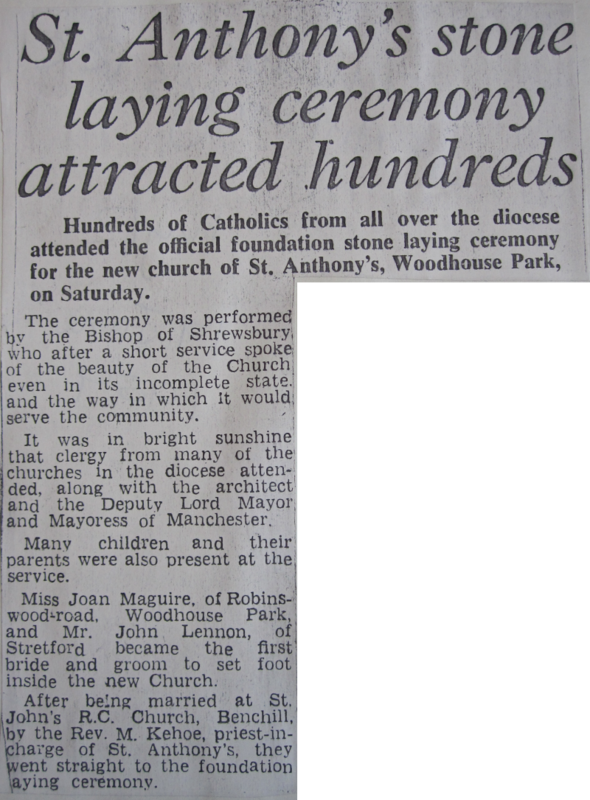 Laying of the foundation stone by the Right Rev. J. A. Murphy, Bishop of Shrewsbury in June 1960. View of St. Anthony's Primary School, looking over the future pulpit.